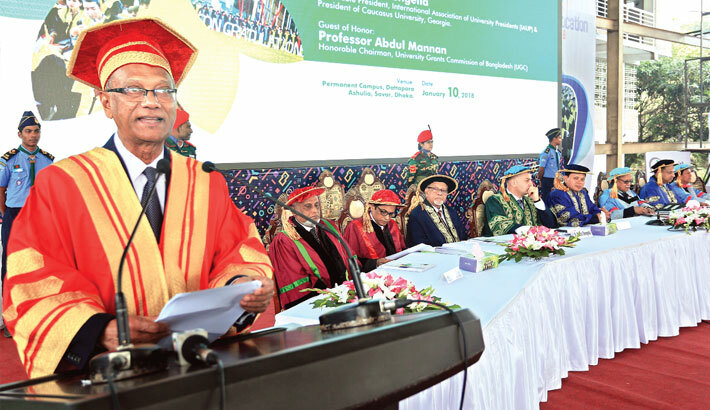 Education Minister Nurul Islam Nahid speaks at the seventh convocation of Daffodil International University on its campus at Dattapara area in Savar on Wednesday. Education Minister Nurul Islam Nahid on Wednesday said the government will take legal action against the private universities which have failed to run the varsities as per the law. Nahid came up with the remarks while addressing the 7th convocation of Daffodil International University (DIU) on its permanent campus in Dattapara area at Savar. University Grants Commission (UGC) Chairman Prof Abdul Mannan, DIU Vice Chancellor Prof Dr Yousuf Mahbubul Islam and Chairman of the university’s Trustee Board Sabur Khan addressed the programme, among others. Dr Kakha Shengelia, President of International Association of University Presidents & President of Caucasus University in Georgia, attended the event as the convocation Speaker. Education Minister said, “We never discriminate between the students of private and public universities. All are our children and we want to ensure quality education for all of them”. A total of 3,498 students were conferred upon graduation and post graduation degrees and among them 15 best result oriented graduates were awarded ‘Gold Medal’ in different categories.